Sporadic Sentinel: San Francisco Giants: April Wins Bring, Uh, More May Wins? 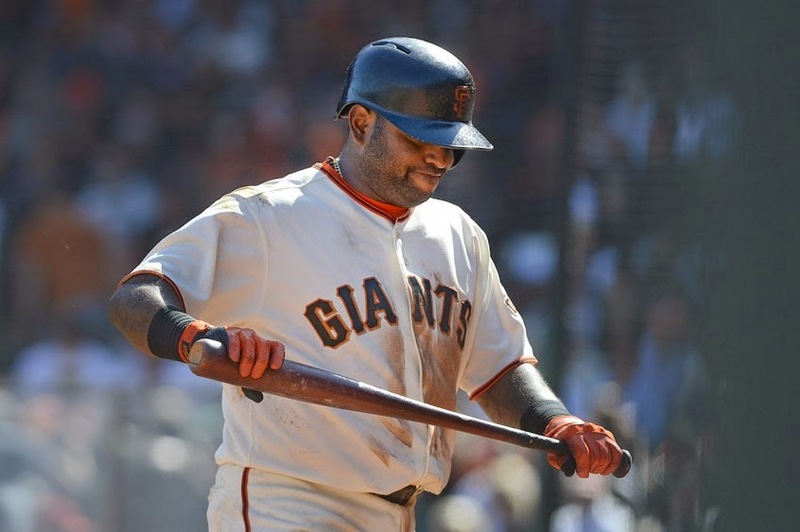 San Francisco Giants: April Wins Bring, Uh, More May Wins? It's the first of May, Matt Cain still doesn't have a win, and the San Francisco Giants are in first place in the NL West. Something about a gift horse certainly appears to apply here. Petit's his name, not who he is. "Phew, I get another chance!" On the subject of pitching, last week in this same space I said, very clearly, that Ryan Vogelsong should be taken out of the Giants starting rotation, after a dismal end to 2013 that was complicated by injuries, and a very bumpy start to 2014. I'm not going to sit here and pretend Ryan made a great start just to show me up, I'm going to sit here and say that Vogey made a great start because he knew the same thing I did- that if he didn't, he was close to done. The injury to Cain gave him a few more starts to step it up, because the guy who would probably have taken his place was Petit. And he's guy who spot-started for Cain and will now be the one who takes Cain's place for the short-term, and not Vogey's. 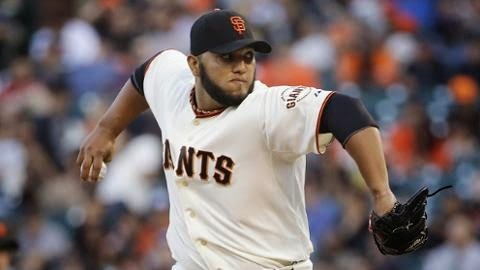 I have no doubt that the Giants are continuing to look for a replacement for Vogey- Kruk and Kuip referenced an interview with Giants general manager Brian Sabean where he said you can't pull a guy out of the rotation “until he's made at least six starts,” and Vogey's sharp seven innings came in start number five- but he's got to prove this week's outing was the norm, and not the exception. I wish I said this next line: somebody on Twitter said that Sabean needed to trade for a third baseman named Brandon, so the Giants could have an all-Brandon infield. They're just a third baseman away, with Crawford at short, Hicks at second, and Belt at first. And while Brandon and Brandon are doing very well at the plate and in the field, Brandon is really have a tough time of it recently. If that made sense to you, congratulations. If not: Crawford and Hicks have back-to-back Sunday walk-off home runs for the G-men and are keeping themselves in the lineup because of more than their defense. The guy having the problems at the plate is Belt. SF manager Bruce Bochy gave Belt the night off on Tuesday because he was nothing but an out at the plate the entire homestand and put Buster Posey at first. That situation is fine if it happens once in a while, but if it continues to happen we're entering the “we don't want this to happen” scenario I noted in my Giants season preview (scroll down a bit, to the “if Buster starts playing first because Belt can't hit the ball, this season is going in the tank” part. Actually, don't bother, because I just told you the scenario. Anyway). The other guy pushing at the plate is the Panda man, Pablo Sandoval. The non-Brandon in the Giants infield came to the plate the other day with a couple of men on and less than two outs and was back to his old tricks, flailing at the forehead-high fastball for strike three. It has been like this for more than a couple of weeks. Panda's manner at the plate just doesn't seem very comfortable. He's pretty easy to figure out in that regard, or maybe I've just watched him enough over the years. I can tell when Panda's in a groove and when he's not, and it's more that just about batting average. I'm not alone in this, most Giant fans can also see it, in addition the broadcasters. Maybe it's because Pablo is thinking too much about that 100-million dollar contract extension he wants (this is the last year of his contract). I'm certain he feels that if Hunter Pence can get at 90-million dollar contract, he can get well over six figures. To which I'm sure Brian Sabean and the rest of Giants brass came back with, “Uh, have you looked at what you've done for us in the past two years? Since blasting three home runs in one World Series game in 2012, you've been super out of shape, injury prone, and if we could harness the wind created by your swings and misses we could power the lights at a middle school for at least six months.” So Panda is not comfortable at the plate. He's made some real nice plays at third to start the season, but did make an uncharacteristic boot in the San Diego series. I can't remember exactly what happened- I do seem to recall it was above average in the difficulty department- but he charged the grounder and it went off the heel of his glove, and it was a play he should have made. Since the report came out that he wants at least 100-million, the miscues at the plate and in the field have become more pronounced. On the flip side, it's nice to hear Duane Kuiper mispronounce Michael Morse's name as “Michael Morris” only about two dozen times a game instead of the six dozen he was doing at the beginning of the year. This really does grate on me, it's like hearing somebody finish a sentence with “at.” Look, if you say “Where you at?” you are horribly botching the English language. First of all, never end a sentence with a preposition. Secondly, the reason you're adding a preposition is because you're skipping a word, and it would sound even worse to not use the preposition and just say “Where you?” Even though it would be less wrong, grammatically speaking, than “Where you at?” The proper sentence is “Where are you?” No “at”, include the “are.” Going back to baseball, as soon as Kuip says “Morris” it seems like Mike Krukow immediately jumps in and says “Morse” about eight times in the next sentence just to counter him. 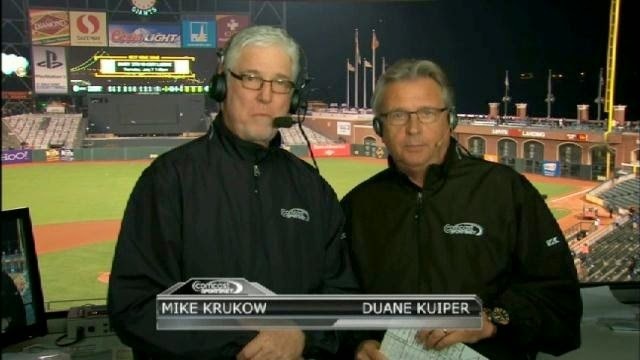 And then Kuip will call him “Morris” in his next sentence. It makes me cringe. Every time. Anyway, Morse/Morris already has more home runs (6) than all the Giants left fielders had in 162 games last year (5). Yes, really. Looking ahead, the Giants have their longest stretch of consecutive games this year, 17 in a row, so their next day off is May 19th. Three in Atlanta, then three in Pittsburgh, including a 9:35 am Pacific time start on getaway-day Wednesday so they can play four at Dodger Stadium starting next Thursday. That's immediately followed by seven back at Phone Company Park starting with three versus those same Bravos and ending with four against Miami, where maybe Brandon Belt can continue the Brandon Sunday walk-off streak on the 18th. And perhaps Matt Cain will have a win by then.